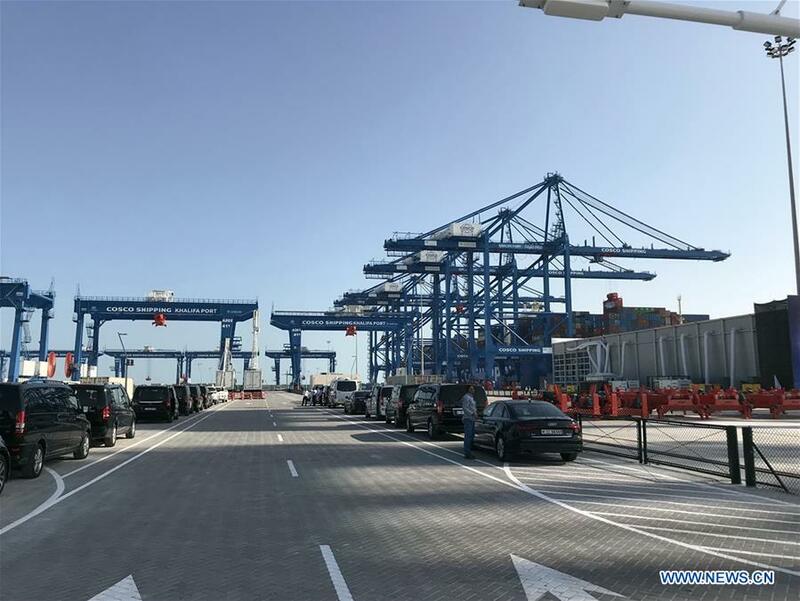 China's COSCO Shipping Ports Limited (CSP) and Abu Dhabi Ports inaugurated on Monday a new terminal at Khalifa Port. The terminal was formally inaugurated at a ceremony by Sheikh Hamed bin Zayed Al Nahyan, chief of Abu Dhabi crown prince's court. The ceremony was also attended by Sheikh Theyab bin Mohamed bin Zayed Al Nahyan, chairman of Abu Dhabi Department of Transport, Ning Jizhe, deputy head of China's National Development and Reform Commission and other officials from China and the United Arab Emirates (UAE) as well as representative of CSP. At the inauguration, Sheikh Hamed bin Zayed Al Nahyan emphasized the cordial and productive relations between the UAE and China over the past 34 years. "China and the UAE share a strong and long-standing bond across a variety of ties, including economic, cultural, and trade. We look forward to nurturing our partnership in a spirit of friendly cooperation," he said. "The decision by COSCO Shipping Ports to invest in Abu Dhabi shows our strategic location, attractive business environment and supportive regulation. We believe that it will open the door to more foreign direct investment," he added. The CSP Abu Dhabi Terminal has a design capacity of 2.5 million TEU (twenty-foot equivalent units) and will begin with a handling capacity of 1.5 million TEU. The water depth of the terminal is 16.5 meters, allowing it to accommodate mega-vessels typically carrying in excess of 20,000 TEU. "The inauguration ceremony is not only a milestone in the cooperation of Belt and Road Initiative, but also a good start for China and UAE's pragmatic cooperation in other key areas," Ning said. China is the UAE's largest non-oil trade partner. In 2017, bilateral trade between the two countries increased by 15 percent to more than 53 billion U.S. dollars, representing 14.7 percent of the UAE's total foreign trade.